A Cook @ Heart: JFI-CHILLIES.. Mirchi Ka Salan .. sort of!!!! JFI-CHILLIES.. Mirchi Ka Salan .. sort of!!!! Chillies.. a necessary ingredient in Indian Cooking... and so thinking of a dish that uses chillies was not really difficult, but selecting A particular dish.. was difficult. Finally I, zeroed in on MIRCHI KA SALAN.. a dish where MIRCHI was the focus, and more importantly, it was a dish I had not tried earlier. I had seen some ready to cook pack 'Kitchens of India' brand I guess.. intrigued by the name, I almost picked it up, but later hesitatingly put it back.. I was not into blogging at that point of time and well, the mind was not as open to experiments as now! The idea however lingered, and then I started collecting recipes.. and so pulling out my SUPER heavy file, I flipped pages over pages (of recipes collected, but not tried) till I came to a bunch , neatly stapled and labeled "MIRCHI KA SALAN"- Hyderabad Special. I had about 10 different versions, so I finally picked out one,and decided to make this with slight variations to suit my taste. Ideally Mirchi Ka Salan is served with Biryani, but I like it just as well with plain Rice , Paratha and ...~sheepish grin~ sliced bread as well! 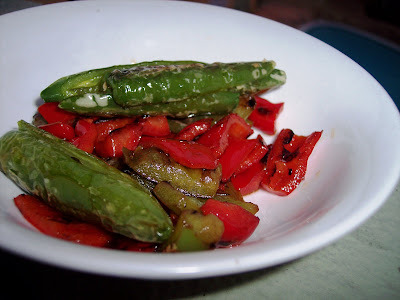 My variation to the standard salan was I added Green and Red Bell Pepper to the Serrano chillies. I simply love the slightly sweet and smoky flavour of the red bell pepper and it blended well with the salan. Chop the Onion and saute till golden brown, cool and grind to a paste. Shallow fry the green chilli and the pepper chunks till you see blisters on it. Heat 1 tsp oil, add the mustard seeds. After they pop, add the curry leaves and cloves. Add the onion paste and stir well. Add the Salan Paste, mix thoroughly and cook for 2 mins, stirring continuously on a medium flame.If the paste sticks to the pan, add some water and cook well. Add the tamarind concentrate, jaggery and cook for about 3-4 mins, till the gravy thickens. Add salt, chillies & pepper chunks. Mix well and cook for a minute. * I chickened out at the last moment and removed the dry red chillies before grinding the paste, thinking that the Serrano chillies would make my hair stand on the end!! but made a mistake there. My adaptation of the salan was VERY tasty, but not fiery! But those who want to enjoy this side dish without smoking at the ears, all I have to say is, go right ahead! This is my entry for JFI CHILLIES, hosted by our own Nandita !! Thank U Nandita for a wonderful choice of ingredient! like Asha said I too loved the sort of mirchi ka salan. 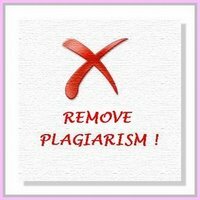 now I have to try it as I am seeing this in lot many blogs. is it very spicy? Tondala paani sutalay baghun! Loved the addition of red bell peppers. What a great recipe. I have never tasted anything like this, but I have a feeling the taste will be amazing, just from the sound of your recipe. Glad you pulled out your big file of recipes! Good one for the JFI chillies. I add chilli in most of my dishes. BTW I have given a link to your blog from mine. Hope it is fine with you. Hi Asha!! thank U!! The fab. taste of red bell pepper was a recent discovery! I love them too! Hi Suganya!! Yep I do file and label (only recipes) but unfortunately, I file and forget!! Hi Sharmi!! My guess is it is supposed to be real hot, but if u deseed the chillies, that brings down the fire. and ideally the recipe calls for approx 10 chillies, I chickened and used 3+ bell pepper!The quantity I have used is good for 2 hungry people and mildly spicy, but enjoyable. Hi Tee!! Mala kadhi taste karte asa jhala hota! nashib, jasti tikhat kela nahi, mast hota salan! Hi Kanchana!! Thank U so much, I am goimng to pull out that file a bit more now! so many recipes to try !! 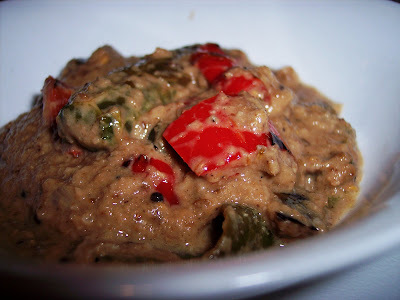 You can try with Brinjal or Okra instead of Drumstick for Kaara Kuzhambu. Good one for JFI. I have blogged this recipe with Jalapeno peppers, which was hot. I ate the masala leaving the chillies aside. Lovely entry Manasi, thanks for this....just working on round up - really liked this so stopped by to say so! Hi Seec, Thank u so much for ur prompt response!! Hi Cynthia, Thank u dear!! Hi Archana, Gr8 minds think alike!!! hehehe!! Hi Jeena, Thank u so much!! 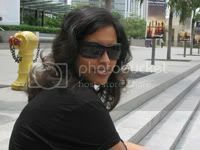 Hi Nandita, thank u dear! I saw the round up... gosh, u had ur work cut out! u did a wonderful job!! Hi Buggy! Thank U so much!! Keep visiting!! JFI- Rice - Fried Rice, Mumbai Shtyle!! DALMA RCI - Orissa And an Award!! !